"…Proclaim the good news of His salvation from day to day. Declare His glory among the nations, His wonders among all peoples (1 Chron. 16:23b-24)." Mission is an important part of serving God. Proverb 19:17 says, " He who has pity on the poor lends to the Lord and He will pay back what he has given." 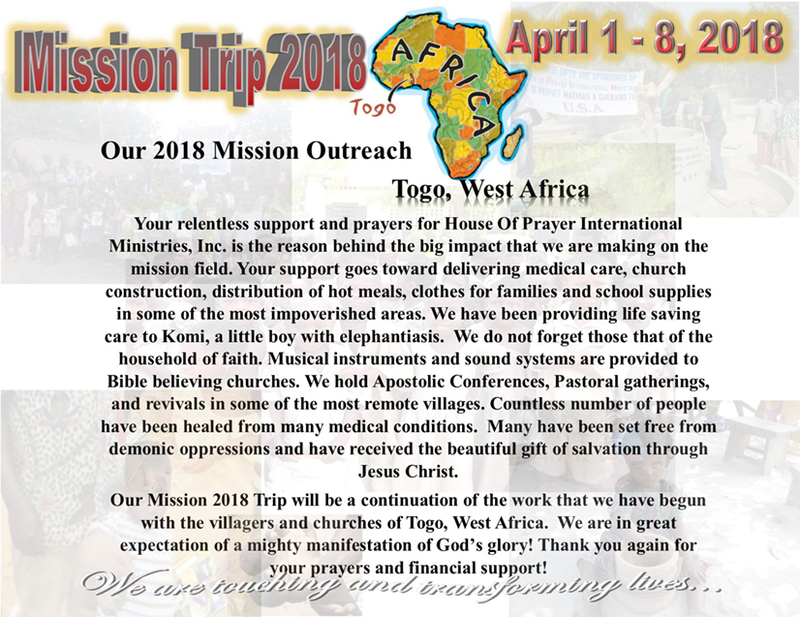 We have mission connections mainly in Togo, West Africa and also in some other countries in Africa as well. As apart of our mission perspective in our church we pray corporately for the peace of Israel and sow into ministries that assist with the humanitarian needs of the Jewish people. The Lord declared, "I will bless those who bless you and I will curse him who curses you (Gen. 12:3)." Our mission work does not overlook the needs right here in the USA. House Of Prayer International Ministries, Inc. shares the love and Gospel of Jesus Christ, visit the sick and shut-in, visit those incarcerated and seek to provide assistance to hungry families in the USA. Overseas, our goals are to dig a well for drinking water in villages, offer school supplies, and give clothing and shoes. We do hospital visits praying for the sick and give financially toward the cost of medicines. One of the most heart breaking things to see is women and children lying on the sick bed with almost no medical attention. They need the money to pay the doctors and to purchase medication. This mission work is to draw the entire village to Jesus Christ not just individuals. With the limited resources that we have we can only say our mission work in Africa, Israel and the USA is just a drop of water in the vast ocean. Today as you give towards missions and put your hand to the work you may not see the immediate impact but the day you stand before the Lord and hear Him say, "Well done, good and faithful servant (Matt. 25:23). For I was hungry and you gave Me food; I was thirsty and you gave Me drink; I was a stranger and you took Me in; I was naked and you clothed Me; I was sick and you visited Me; I was in prison and you came to Me (Matt 25:35-36)." Then you will understand the magnitude of your contribution and receive your rewards. It is our prayer that the Lord gives you a compassionate heart and willingness to serve Him on the field of mission. However, we know that everyone will not be able to physically go but you can go by praying for us and making a financial contribution towards the work of the ministry. You will receive a receipt of your contribution.